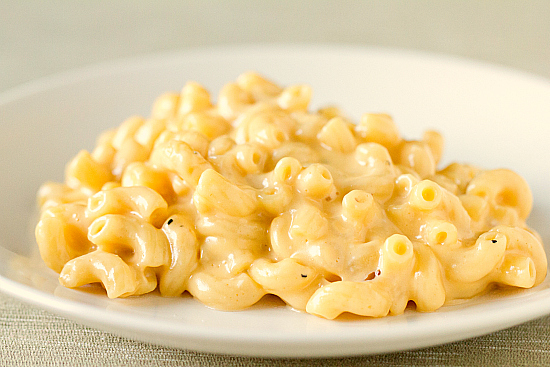 This low fat Mac & Cheese is to die for! 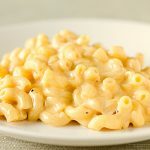 if you’re trying to watch fat intake, but still want to enjoy a delicious mac & cheese, this is the recipe for you. It’s from America’s Test Kitchen Episode: “Lighter Family Favorites.” One thing to watch out for with this one- It doesn’t store well. you want to eat it within a while of it being made, or pasta will absorb the cheese sauce and it will end up being dry. Bring 2 1/2 quarts water to a boil in a large saucepan. Stir in 2 teaspoons salt and the macaroni; cook until the pasta is completely cooked and tender, about 5 minutes. Drain the pasta and leave it in the colander; set aside. Add the evaporated milk, 1/2 cup of the 2 percent milk, mustard, garlic powder (if using), cayenne, and 1/2 teaspoon salt to the now-empty saucepan. Bring the mixture to a boil, then reduce to a simmer. Whisk the cornstarch and remaining 1/4 cup milk together, then whisk it into the simmering mixture. Continue to simmer, whisking constantly, until the sauce has thickened and is smooth, about 2 minutes. Off the heat, gradually whisk in the cheddar until melted and smooth. Stir in the peas, and macaroni, and let the macaroni and cheese sit off the heat until the sauce has thickened slightly, 2 to 5 minutes, before serving.